Vertigo – an abnormal sensation of motion, marked by dizziness and a feeling that you or the environment around you is moving or spinning. Ménière’s Disease – a disorder of the inner ear that causes severe dizziness, ringing in the ears, hearing loss and a feeling of fullness or congestion in the ear. Vestibular Neuritis – an acute vestibular syndrome consisting of vertigo or dizziness that develops acutely and is accompanied by nausea, vomiting, gait instability. Tinnitus – a symptom that something is wrong in the auditory system, commonly described as a ringing in the ears. Sarah McGuire graduated from Northwestern State University in Natchitoches, Louisiana with a Master of Science in Nursing. 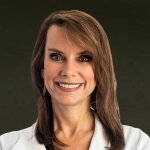 She holds national certification and is licensed to practice in Louisiana and Mississippi. For appointments, please call CNC Hearing and Balance at 504-934-8321.